The Ikelite Housing for Canon 5D Mark IV is crafted from high-quality ABS polycarbonate which is stronger and lighter than the previous style Ikelite housings. While cream colored, the housing still has a see-through back to be able to easily check o-ring seal and control placement. The new DryLock ports are easy to install and more secure than the older system. This is a great quality housing, at a much more affordable price than the high-quality aluminum options. 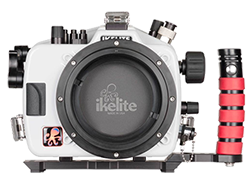 The Iklelite Housing is also compatible with the Canon 5D Mark III, 5DS, 5DS R.
The Aquatica A5DIV Underwater Housing is a high-quality housing, machined from aircraft grade aluminum and finished to withstand rough ocean conditions. It features well-placed controls that are easy to use with or without gloves. 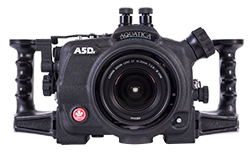 Aquatica offers a full selection of ports for a wide variety of lenses and many great accessories such as external viewfinders, vacuum bulkhead, wet lenses and more. Popular choice by tech and cold-water divers. 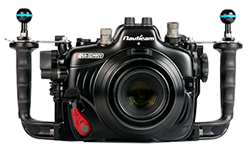 The Nauticam NA-5DMKIV Housing is a high-quality aluminum housing that is designed with ergonomics in mind. The goal from Nauticam is excellent user experience, so along with repositioning controls for the best placement when shooting underwater, they also offer a robust line of ports for a variety of lenses, and many useful accessories to customize the perfect kit for your shooting style. 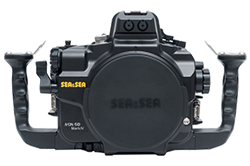 The Sea & Sea 5DMKIV Underwater Housing is a great quality aluminum housing with spring loaded controls to prevent slippage. Integrated TTL control of Sea & Sea strobes is possible with the optional YS Converter. Many key controls were placed to be easily accessible while still holding onto the grips. Sea & Sea offers a solid line of ports for all lenses as well as many useful accessories such as a vacuum bulkhead, external viewfinders and more. The Sea & Sea Housing is also compatible with the Canon 5D Mark III, 5DS, 5DS R.
The Canon 5D Mark IV camera is the flagship full frame option for Canon DSLR shooters. 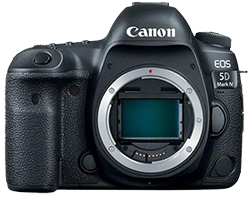 Canon made significant upgrades from its predecessor, the 5D Mark III. The camera delivers excellent full-frame image quality with its 30.4 megapixel CMOS sensor and its new dual-pixel autofocus technology. It also offers its new DIGIC 6+ processor, 4K video, 61 AF points (41 cross-type), touch panel LCD, and enhanced high ISO performance.